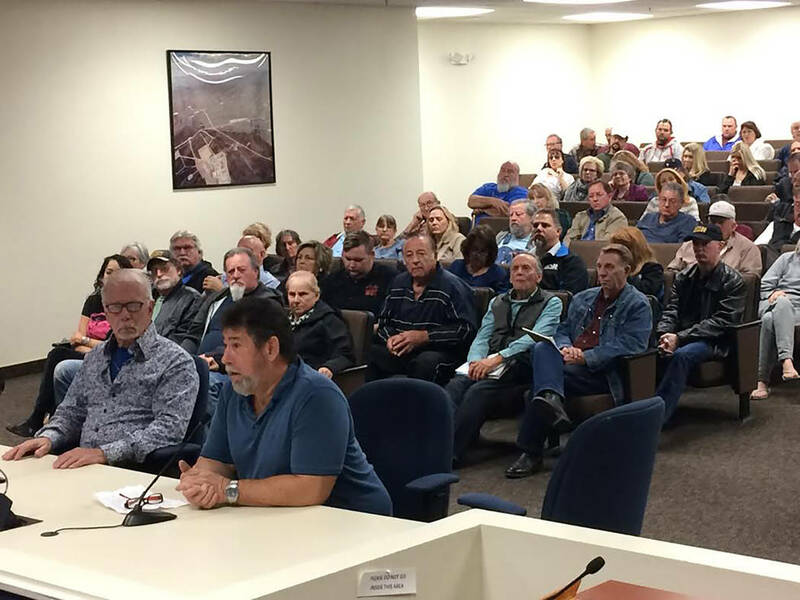 The Nye County Commission, sitting as the governing board of the town of Pahrump, voted by a narrow margin to forego pursuit of legal action against an order issued by the Nevada state engineer during a special meeting held Wednesday, Jan. 10. Robin Hebrock/Pahrump Valley Times Pahrump business owner Gerald Schulte was just one of dozens who spoke against Nevada State Engineer Order #1293 which requires water rights relinquishment for all new domestic wells. Robin Hebrock/Pahrump Valley Times Pahrump resident Wendy Oneal said she was at a loss as to how to live on her recently purchased property when she is unable to afford to water rights now required in order for her to drill a domestic well. Robin Hebrock/Pahrump Valley Times Nye County Commission Chairman John Koenig was the swing vote during the Jan. 10 special meeting held by the Nye County Commission to address a water order issued by the Nevada State Engineer. The commission ultimately voted to take no action. The decision sparked outrage among many and even brought some to tears as they blasted the state engineer’s order as a dream killer. The special meeting was called to address Nevada State Engineer Order #1293, which came at the request of the Nye County Water District Governing Board. The order requires all property owners in Pahrump who wish to drill a new domestic well to first purchase two-acre feet of water rights. Those water rights must then be relinquished back to the state. There are only two exceptions to the order. Current domestic wells in need of refurbishment as well as those needing replacement, which are not located in an area served by a water service entity are exempt. Undeveloped lots where water rights have already been relinquished or dedicated in favor of a domestic well are also exempt. Nevada State Engineer Jason King issued Order #1293 on Dec. 19. The move caused a whirlwind of angst in the valley as realtors, property owners, developers and others questioned what potentially harmful consequences the order would create. 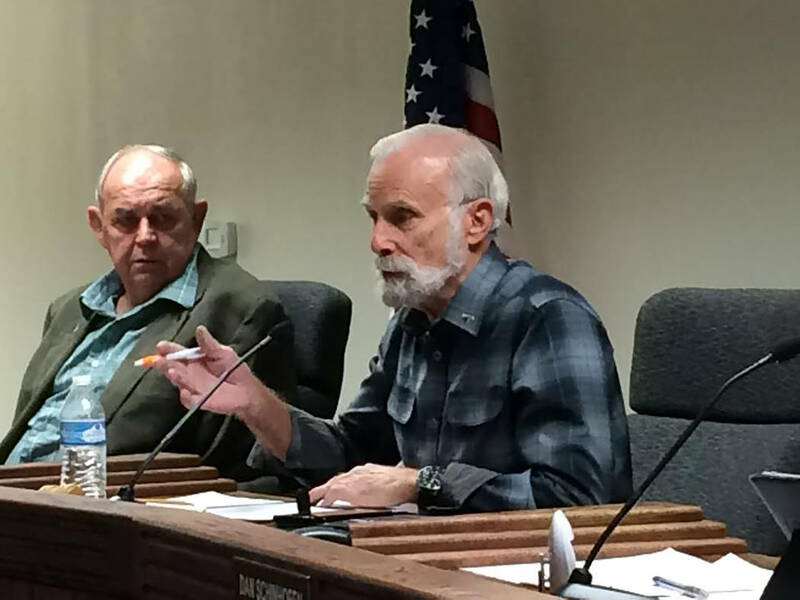 Nye County Commissioner Butch Borasky had an item placed on the agenda to consider taking legal action to stay the order, utilizing town of Pahrump funds. During the meeting, residents kept up a steady stream of comment, much of which slammed the order as one that does absolutely nothing to solve the water problems in the Pahrump Valley. Developer Michael Lach echoed Turner’s comments and suggested other options, such as conservation wells, be looked into in lieu of the order. Realtor Norma Jean Opatik was yet another who asserted that the order would not conserve an ounce of water. “It transfers wealth, that’s all it does!” Opatik stated. Since the order was issued, several realtors reported that the price of water rights has skyrocketed to about $10,000 an acre-foot. Local Realtor Trish Rippie stated that the increased cost may even have the unintended consequence of halting commercial development in the valley, as developers may not be able to bear the inflated prices. Businessman Gerald Schulte lamented the negative impact the order would have on low-income housing availability and stated he would be moving his manufactured home business to Arizona as a result. In perhaps the most emotional testimony of the meeting, residents who recently purchased property took to the microphone to explain just how the order was affecting their lives and families. Wendy O’Neal stated that she filed an intent to drill card with the engineer on Dec. 19 but that was denied due to the order. “I don’t have the money to purchase two-acre feet of water rights. I planned a certain amount of money for the land and now my only option is to re-uproot my family and go back to Vegas and live there,” O’Neal said. There were other speakers with similar stories as well. 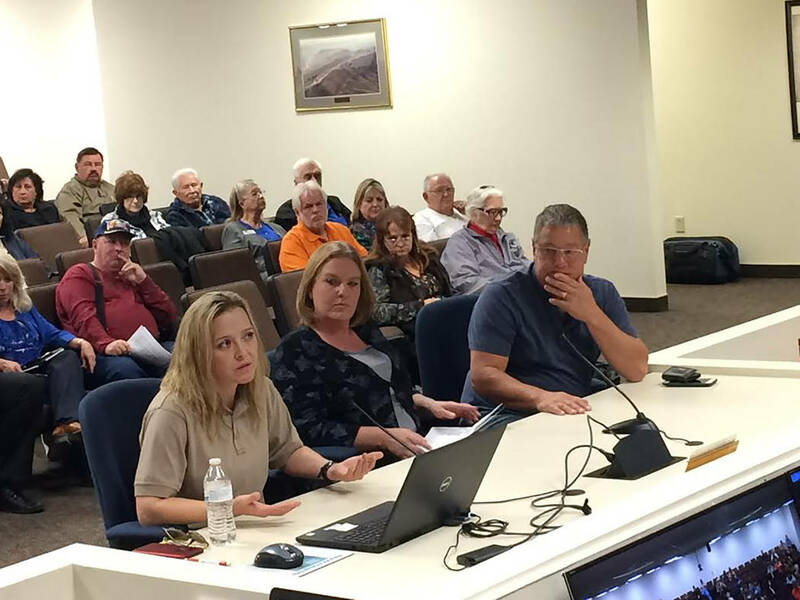 Both Melissa Campbell and another property owner stated that the order essentially ended their dreams of building a home in Pahrump. Dave Rigdon, an attorney with expertise in water law, offered the commission a completely free-of-charge consultation to discuss the possibility of legal action so they would have a clearer picture of the situation. However, when Borasky made the motion to sit down with Rigdon before taking further action, his motion was voted down by commissioners Dan Schinhofen, Lorinda Wichman and John Koenig. Schinhofen noted that he did not support taking legal action because he believed the order provided protection for the 11,000-plus existing domestic wells. After the vote was cast, resident Walt Turner told the commission and the audience that a coalition of locals would be taking the issue into its own hands. Turner assured that they would be doing all that was necessary to file a lawsuit to stop the order in its tracks.